Milton Friedman (1912-2006) was an American economist, famous for his writings that formed the basis of the monetarist macroeconomic policy that opposed Keynesianism. In 1976 Friedman was awarded the Nobel Prize in Economics “for his achievements in the fields of consumption analysis, monetary history and theory and for his demonstration of the complexity of stabilisation policy”. Friedman was born in 1912 to Jewish immigrants in New York before moving to New Jersey. Considered naturally talented from his early youth, Friedman graduated from Rutgers University in 1932 where he specialised in mathematics with the ambition to be an actuary. However, following the advice of two economics professors, he took an MA in economics at the University of Chicago during which time he met his future wife, Rose. Following his MA, Friedman worked on the New Deal Project but found himself opposed to much of its policy ideas. Following work at the National Resources Committee and the National Bureau of Economic Research during the late ’30s, Friedman eventually found academic work at the University of Wisconsin–Madison as an assistant economics professor but, after encountering anti-Semitism, returned to government services working on wartime tax policy between 1941-43. Friedman spent the rest of the war at Columbia University working as a statistician for weapon designs and was awarded a PhD in 1946 for a thesis on income of professional practice. He taught at the University of Minnesota for one year after the war before joining the University of Chicago in 1946 to teach economic theory – a position he remained in for 30 years. In Chicago, he contributed to the development of the Chicago School of Economics as well as returning to the National Bureau of Economic Research where he worked alongside Anna Schwartz to publish A Monetary History of the United States, 1867–1960 in 1963 that formed the basis of Friedman’s monetarist views on macroeconomics. He was also known for his books aimed at a general audience: Free to Choose and Capitalism and Freedom. Likewise, Friedman produced a weekly column for the ‘Newsweek’ magazine between 1966-84 which was influential amongst politicians and businessmen alike. Following his Nobel Prize in 1976, Friedman retired from academia but continued in other capacities including presenting the ‘Free to Choose’ TV programme; working as an unofficial advisor for the for the Reagan 1980 presidential campaign and serving on the President’s Economic Policy Advisory Board for the rest of the Reagan Administration. He regular featured on TV and in newspapers during the ’80s and ’90s before his death in 2006 from heart failure. Friedman is best remembered as a leading economist within the monetarist school of macroeconomics. He revived the quantity theory of money which argues that the price level depends on the money supply; in the short run increasing the money supply will boost employment and economic output but in the long run economic output would largely be unchanged and prices would increase. Through his empirical study of monetary history in America, Friedman found that economic fluctuation was influenced by fluctuation in the money supply and that inflation was caused by excess money supply generated by a central bank. He believed that inflation is ‘always and everywhere a monetary phenomenon’ and to control inflation requires the money supply to be increased at a constant percentage rate each year – the so-called Friedman’s k-percent rule. For Friedman, targeting the money supply was the best policy available to government as it prevented the most disruptive effect on economic activity, inflation. Friedman also made important academic contributions to consumption analysis through his criticism of the Keynesian consumption function which believed households adjust their consumption on the basis of their current disposable income. Friedman put forward the view known as the permanent income hypothesis that argued temporary changes to current income have little impact on consumption and it is instead permanent changes to income over a few years that have the largest impact. The theory holds that rational consumers would spend a proportional amount of what they perceived to be their permanent income and lower earners have a higher propensity to consume than higher earners. 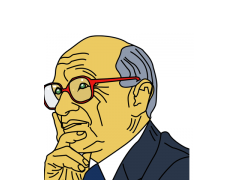 A lasting key idea of Friedman’s was his theory, the natural rate of unemployment, and his view that policies trying to decrease this rate would be harmful to the economy and would create inflation. Unemployment could not be permanently brought down by bringing about higher inflation, as Keynesianism suggested, because once people adjusted to the higher inflation rate, unemployment would begin to increase. The stagflation – rising inflation combined with rising unemployment – of the 1970s appeared to give empirical evidence of Friedman’s views on the natural rate of unemployment. More broadly, Friedman exposed free-market economics and policies that matched this. In his book Capitalism and Freedom he outlined many of his key ideas in favour of free-markets such a volunteer army, freely floating exchange rates, the abolition of the licensing of doctors, a negative income tax, privatisation and education vouchers. Friedman’s legacy was largely unchallenged in the 20th century. He is widely seen as the most important economist of the second half of the 20th century and remembered, behind John Maynard Keynes, as the most popular economist of the whole 20th century. His monetarist macroeconomics and general favouring of free-market policies were important influences on the Thatcher and Reagan governments. During the ’80s, the UK underwent massive free-market reforms and used their control over the money supply to guide the economy– all directly influenced by Friedman’s economic theories. Following the breakup of the Soviet Union, Friedman’s books become popular amongst Eastern European readers, as well as being an influence on the economic policies in the region, especially in Estonia. In academia he is also noted for adjusting the views of Keynesians who came to accept some of his main theories, especially on the natural rate of unemployment in the wake of stagflation. His monetarist economics contributed to monetary policy – money supply, interest rates, freely floating exchange rates – and gained significance in mainstream economics and policymaking, largely displacing Keynesian demand management and fiscal policy.